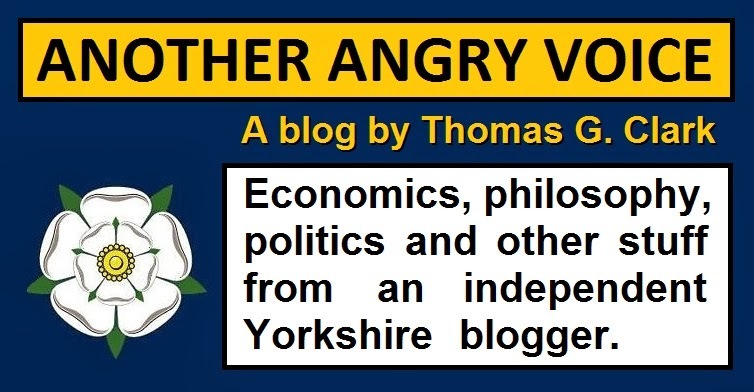 The defender of right-wing cut now, think later indiscriminate austerity policies will often be seen trotting out a particularly feeble analogy in which they make a comparison between government borrowing and household finance. Argument by analogy is rarely informative, but in this case it is a downright misleading example of argument by spurious similarity. All four quotes can be summed up in two words; Asinine nonsense. What these quotes demonstrate is that David Cameron and his party show no understanding of basic accounting. Hardly surprising from a bunch of over-privileged career politicians with barely a moments real world experience of running businesses or struggling to get by on limited family budgets between them. The first and most obvious difference between a commercial credit card and national borrowing is the massive difference in interest repayments. A typical interest rate on a commercial credit card could be 16.9% whilst the interest on UK government bonds is below 2% as investors are flocking to buy bonds in safe haven countries that maintain their good credit ratings such as Germany, the UK, Japan, the Netherlands and Finland. In May 2012 it was announced that the yield on 10 year bonds had fallen to an all time low of 1.87%, the lowest since the Bank of England records began in 1703. With inflation running at above 3% what these ultra-low interest yields create is a phenomenon called negative real interest rates, which occurs when the interest payout is lower than the rate of currency devaluation. This indicates that investors are so scared of the financial turmoil elsewhere, they are prepared to incur a real term loss in order to invest their money in the "safe haven" of UK (or Finnish) government bonds. An example of this can be seen in the sale of £700 million of inflation-linked 35-year gilts in January 2012, with a rate of -0.116pc, meaning investors were accepting a small real-terms loss in exchange for lending their cash to the UK government. Investors that buy this kind of gilt are in effect paying a small fee in order to protect their capital from the ravages of the neoliberalised financial markets and the risk of sovereign default elsewhere. The right-wing apologist would argue that their beloved austerity measures aimed at cutting government borrowing are precisely the reason that the UK is becoming a "safe haven" for investors. This simplistic narrative is undermined by the fact that similar austerity measures in countries such as Spain and Greece have coincided with sharp rises in government borrowing costs and that despite the Coalition government's economically damaging indiscriminate austerity agenda, the rate of UK government borrowing is still actually on the rise. 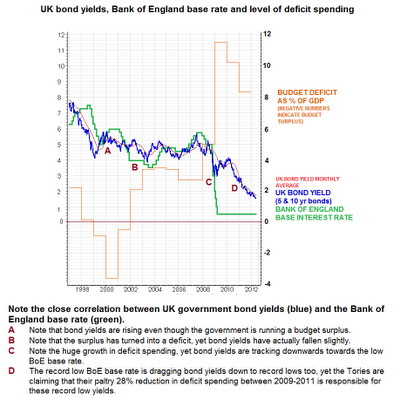 A much more realistic explanation for the low interest rates on UK government debt is that fear of stock market instability, large scale financial sector corruption, rising inflation and the risks of sovereign default elsewhere are driving investors towards the relative safe haven of extremely low yield investments that will pay out in Pounds. Another contributory factor that cannot be ignored is the Bank of England's policy of holding interest rates at an all time low of 0.5% for three years. Anyone arguing that these all time record low interest rates and the all time low cost of government borrowing are completely coincidental and that the low borrowing costs are actually a sign of "market approval" for their favoured contractionary fiscal policies should be treated with a great deal of suspicion. 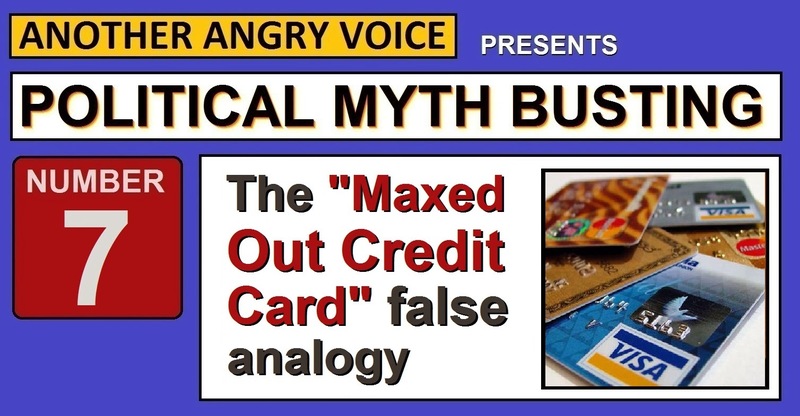 Returning to the credit card analogy, it is absolutely clear that it is an example of argument by false analogy because a credit card demands extremely high real term levels of interest repayment and current UK government borrowing actually pays a dividend in real terms. To create a more realistic analogy: If you had a credit card that actually cost less in interest repayments than the rate of inflation, I'm pretty sure you'd use it a lot. If I had one I wouldn't use it to buy consumer goods from Chinese factories, I'd set up my own company and invest in assets with potentially strong returns (precious metals, shares in high tech industries, perhaps shares in German and Japanese alternative energy companies given their governments' recent decisions to abandon nuclear power and "go green"). Once the interest rates start to rise back above the level of inflation I'd begin to make repayments using the profits from my investment portfolio and my business income to fund them. What the government should be doing is using the all time low borrowing costs to invest in proven fiscal multipliers such as infrastructure projects, house building, education, research and welfare payments in order to boost the economy out of recession, because with a contracting economy and shrinking tax revenues, cuts in investment are likely to further reduce aggregate demand and drive the economy into an austerity death spiral. The right-wing apologist would obviously claim that any such increase in the national debt would "chase away" investors, increasing the yields on UK bonds and undoing all of their "vital austerity work" but this fantasy scenario also relies on the ignore the facts tactic. The lowest yields of all are on Japanese government bonds (0.858% on ten year bonds) and their national debt eclipses that of the UK. If investors really were scared of large government debts the yields on Japanese bonds should be more like the unsustainably high yields on Greek bonds rather than less that half the yields on UK bonds. My previous analogy about the negative real interest credit card shows that any comparison between government borrowing and credit card spending would rely on an absurd redefinition of "credit card", however there is another form of government borrowing that can be more accurately compared to credit card borrowing; the practice of PFI investment. This kind of borrowing occurs when the state outsources infrastructure projects to private sector corporate interests who borrow at commercial rates (typically more than double government borrowing rates) to fund the infrastructure investment and then lease the completed infrastructure project back to the state on long fixed term contracts which over the course of the deal end up costing many multiples of what it would have cost the state to fund the construction directly. The only political benefit from this kind of PFI "economic alchemy" deal is that it allows infrastructure to be built with no up front state investment costs. The downside, much like credit card spending, is that PFI contract repayments eventually cost a great deal more than paying "cash up front". If the Tories were serious about cutting wasteful public spending they would have stopped this kind of grotesquely inefficient public sector handout, instead they are signing off on as many of these deals as Neo-Labour ever did because it fits their political agenda of transferring as much state income directly into the corporate sector as possible. The repeated use of the national credit card analogy exposes many things about the Tory mentality. Firstly that they are either economically illiterate or they hold the public in such contempt that they feel that they can get away with simplifying complex economic circumstances down to a feeble and inaccurate analogy. Secondly that they don't really believe in their feeble household finance anaolgies at all, because if they did they would be borrowing more via low negative real interest government bonds (low interest loans) in order to stop using and buy out the existing outrageously expensive PFI sector schemes (Credit Cards) altogether, like any sane budget balancing family would do. Instead they are signing up to more and more of these hugely expensive PFI deals that have been described by a Commons Select Committee as an " an extremely inefficient method of financing infrastructure projects". "getting something now and paying later. Any Whitehall department could be excused for becoming addicted to that....We can’t carry on as we are, expecting the next generation of taxpayers to pick up the tab. PFI should only be used where we can show clear benefits for the taxpayer. We must first acknowledge we’ve got a problem. This will be tough in the short term but it should benefit the economy and public finances in the longer term."